I was sorry to have missed Chris Cloke’s talk on the Nemea Valley at the recent meeting of the Archaeological Institute of America. He was kind enough to send me a draft of the paper which has got me thinking again about the human behaviors behind artifact scatters documented in archaeological survey. Since Bill Caraher and I have recently been working on papers interpreting artifact scatters in the Eastern Korinthia and a large site in Cyprus, Chris’ paper has generated food for thought. As Chris has undertaken some cutting-edge distributional survey analysis, I was delighted that he was willing to contribute an overview of his work here. This three-part blog series discusses a component of his Ph.D. dissertation on a regional study of the Nemea Valley Archaeological Project(NVAP). For a little background, Chris Cloke is a Ph.D. candidate in the Department of Classics at the University of Cincinnati, who has participated in fieldwork in Italy, Albania, Greece, Armenia, and Jordan and is broadly interested in Greek and Roman landscapes. If you’re interested in reading more about his research in the Nemea Valley, check out p. 10 and 12 of the fall 2011 edition of Akoue (the newsletter of the ASCSA). Chris’ essay starts here. First of all, I’d like to thank David for offering me this space to share some of my research: I’m a great fan of David’s work and of this blog, and hope that presenting a few preliminary thoughts here over the next several days will further a productive dialogue about survey methodology and interpretation of results as they relate to the history of the Corinthia and northeast Peloponnesos. I’ve been working for some time now with the landscapes documented by the Nemea Valley Archaeological Project (NVAP). 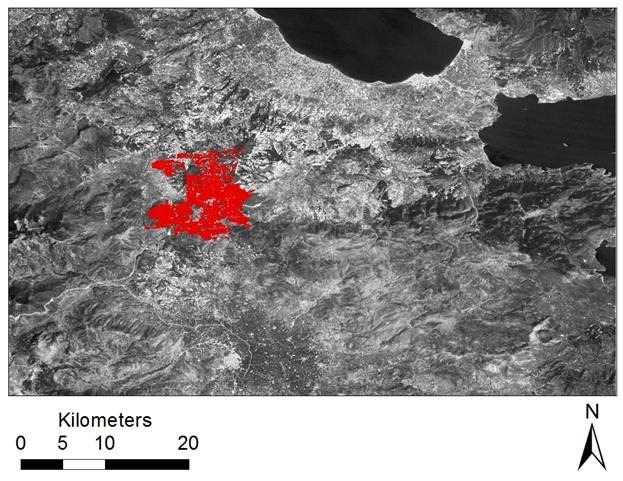 During the mid to late 1980s, NVAP intensively surveyed an area of roughly 80 square kilometers comprised of the inland valleys around ancient Nemea, a site neighbored by Kleonai on the east and the small polis of Phlius to the west. The sanctuary of Nemea, the site of Panhellenic games beginning in the 570s BC, has benefitted from a long-running program of excavations by the University of California, Berkeley, under the direction of Steven Miller and more recently Kim Shelton. Although Nemea’s ancient political ties were primarily to Argos and Kleonai (both poleisoversaw the games at one time or another), the sanctuary was situated just west of Corinthian territory. The survey area’s most striking landmark, the towering plateau of Mount Foukas (ancient Mount Apesas, site of an ash altar to Zeus pre-dating cult activity at Nemea itself), is equally magisterial when viewed from Acrocorinth and the plains to its southwest. 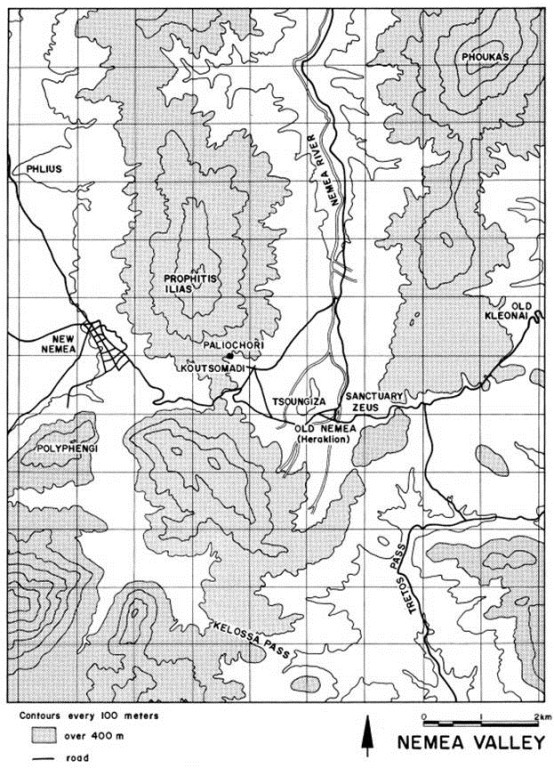 Map courtesy of the Nemea Valley Archaeological Project. Drawing by Julia E. Pfaff, reprinted from page 581 of Wright et al., “The Nemea Valley Archaeological Project: a Preliminary Report,” Hesperia 59 (4):579-659. The lone polis within the study area, Phlius was built on the foothills overlooking a broad valley just west of Nemea, and was the last major settlement before Stymphalos to the west and Sikyon to the north. The southern part of the NVAP survey area was criss-crossed by the Dervenakia, Tretos, and Kelossa passes, which offered the best overland access from Corinth toward Mycenae and Argos to the south. In short, Nemea’s importance was largely religious, but its surroundings also served as a key territory for getting from the Isthmus to places deeper into the Peloponnesos. 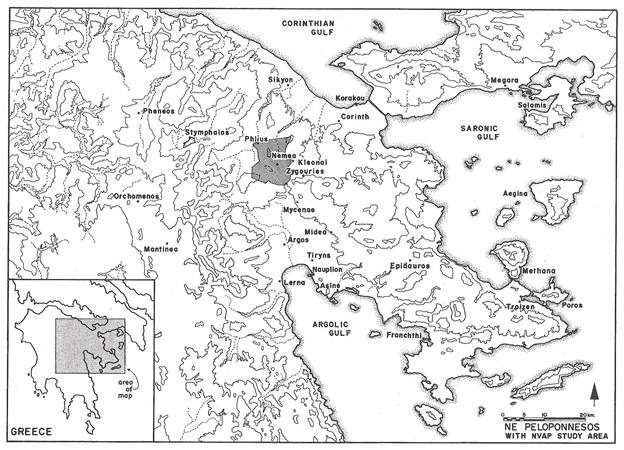 Map courtesy of the Nemea Valley Archaeological Project. Drawing by Julia E. Pfaff, reprinted from page 586 of Wright et al., “The Nemea Valley Archaeological Project: a Preliminary Report,” Hesperia 59 (4):579-659. 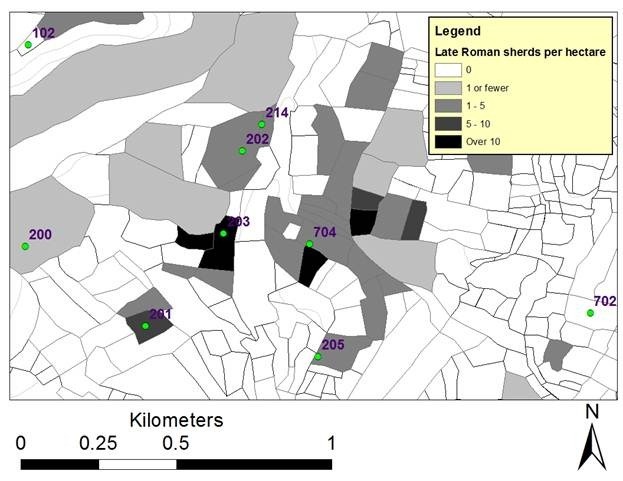 As is the case with many surveys, one of the most difficult aspects of the data generated by NVAP is the rather low density of sherds dotting much of the landscape. Many archaeologists and historians, including David himself, continue to debate exactly how pot-sherds end up strewn across great distances, blanketing the ground, albeit fairly sparsely. My goal with the three posts I’ll be contributing here is not to provide a single, catch-all explanation for off-site sherd scatters but rather to consider some patterns among the NVAP material, and to offer a few conclusions about how historical phenomena in the past may be represented by archaeological finds. One common explanation for the small quantities of sherds blanketing the areas walked by surveys is that these cultural artifacts were transported into fields together with manure (see, for example Bintliff and Snodgrass’s “Off-Site Pottery Distributions”; and for a different take on the problem, Alcock, Cherry, and Davis’, “Intensive survey, agricultural practice and the classical landscape of Greece,” in Classical Greece: ancient histories and modern archaeologies). The reason archaeologists care so much about whether, and to what extent, ancient farmers spread manure over their fields is closely tied to any attempt to derive meaning from survey ceramics. Those who believe manuring by ancient farmers was considerable see the presence of sherds throughout the landscape as evidence of this practice, while skeptics are able to provide a wide range of other reasons that sherds and other artifacts have come to rest in seemingly empty fields. Some common ideas are that these finds are traces of small-scale, short-lived, or mobile rural activities, that they represent activity at small farms where any buildings were made only from perishable materials, or perhaps that the sherds once made up the fabric of ancient roads – pots in the potholes, as it were. We cannot begin to understand how and why artifacts become strewn across the landscape unless we fully engage with the details of a variety of past practices which have shaped the landscape in many different ways over the centuries. One possible sign of manuring frequently documented by survey archaeologists in Greece is the so-called “halo effect,” whereby sherds densities decrease as one moves away from sites. This phenomenon has been noted on a large scale around cities and towns, and on a smaller scale around individual farmhouses. Because this pattern appears among the NVAP spatial data, and because the area’s landscape as a whole is characterized by low numbers of sherds in a widespread, though discontinuous “blanket,” I began exploring the idea that manuring in various periods, by various agents, may have been responsible for at least some of the off-site material encountered. In the next post in this series, I will describe some quantitative approaches used to supplement and question patterns in the spatial data such as the example shown here. For their intellectual, moral and financial support of my work I’d like to thank Jack Davis, John Cherry, Kathleen Lynch, Steven Ellis, Alan Sullivan III, Jim Wright, Susan Alcock, Kim Shelton, Elizabeth Langridge-Noti, Heather Graybehl, Mark Hammond, Sarah James, Emily Egan, the University of Cincinnati Department of Classics, the American School of Classical Studies at Athens, the staff of the Nemea Museum, and the 37th Ephorate of Prehistoric and Classical Antiquities in Corinthos.